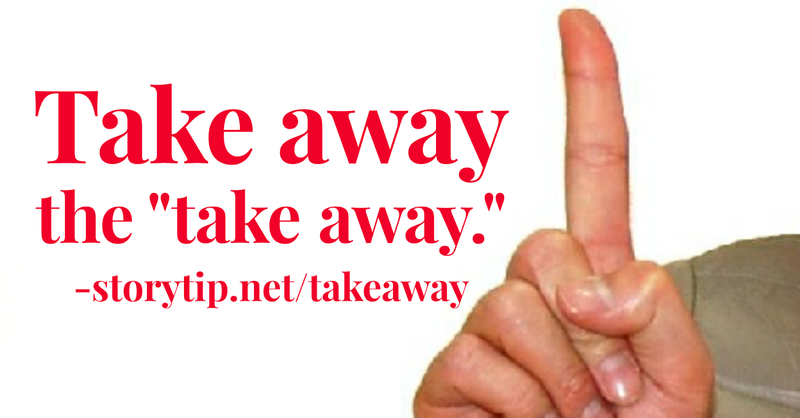 A Quarter for a Tale from Sean Buvala: Take Away the "Take Away." 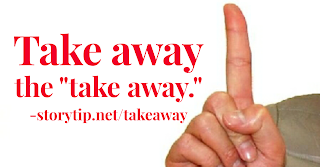 Take Away the "Take Away." May I Suggest: Don't always tell people what to think about your stories. As a Storyteller, you might need to learn to trust that the relationship between you and the audience is something that develops. First, it grows because of your ability to be open and accessible as a teller. Secondly, it grows because your audience is full of competent, life-living human beings. In all actuality, our role as storytellers is to help the audience discover for themselves their own understanding of the subject that we're talking about. It's easy sometimes to think that when we finish telling a story, and this is especially true in telling personal stories, that we need to tell them why we have talked about the story that we just presented. It's as if we can't quite trust the audience to figure out for themselves what our story might mean in their own lives. You know this essential truth: our stories must be appropriate for the audience that we're speaking to. If you practice this careful selection of well-crafted tales, then the audience won't struggle with the story that you told them. The time to be concerned about whether or not the audience understands why you are telling a story is in the crafting process. The time to be sure the audience understands is not at the end of telling the story, it's before you stepped on the stage. When your story connects to world-sized Truths, there is no need for "here's the moral of the story" lecturing. Telling an audience what to think, what to "take away," rips the audience out of the transcendent experience of the story. It turns the teller into a preacher or teacher, not a storyteller. Now there are times, of course, when you are telling stories in a teaching situation. In those roles, your stories will tend to be more didactic, and it's okay to walk the audience through a discussion about why you told the story the way that you told the story. And I would always encourage you to engage anyone who, after you telling, says, "Can we talk about that story?" 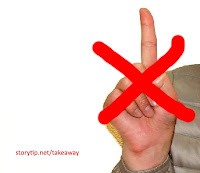 However, I think that for most performance pieces, open-mic storytelling events, or personal storytelling nights, this "take away" habit that people are falling into now (explaining why they told the story) is really detrimental to the art form, to the storyteller and, I believe, to the audience. Frankly, if you get to the end of your story and you feel you have to explain what the story is about, then you're not doing your deep work in crafting your story in the first place. It's simply too lazy to get to the end of your personal tale and then tell the audience what they should take away from your story. It falls back to, "Show, don't tell." Let's be clear, your role as a storyteller of personal tales is to be the student of the experience you are describing. You are walking with the audience, not shoving them forward. Be ready to engage with audience members after your story, but start with what in your story resonates with them. These issues have been a big part of how I form the stories I tell. I talk much more deeply about this in my "Sea-Glass Storytelling" workshop. In that workshop, I examine the differences between storytelling, preaching, advertising, manipulation, teaching and more. 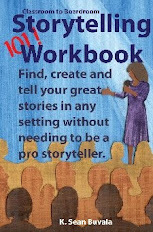 You can visit seaglassstorytelling.com to see when the next workshop is happening or if we have finally released the workbook.If you are really brave, then let's do the workshop at your next conference, festival or guild meeting. Get at me. I'd invite you to work more intently on creating well-crafted stories so that the need to explain yourself the end of the story really is not existent. Facilitate understanding, don't preach. You'll be shocked how much you learn. Get my weekly newsletter in your Email. The is the official blog for K. Sean Buvala, storyteller and storytelling coach. My thanks to the very talented Mark Goldstein for the picture of me performing.